My wife and I just returned from our first ever trip to the Holy Land. Especially at this time of the year, it was something we’ll never forget and hope all get to experience some day. First, God showed us his sovereign power with a “100 year” snowstorm in Jerusalem that scrambled our plans as the ancient and most controversial of all cities in the world, Jerusalem, was shut down for two days. Without this snowstorm, however, we would have missed out on two remarkable experiences. The first was being invited to an Israeli Kibbutz for dinner. I had never heard of such a thing, but one of the gentlemen I was working with at The Technion lived in one—co-founded by his grandfather in the early part of the twentieth century—and my new friend invited us to dinner. We had a delightful evening with the family in their Kibbutz, located in the Jezreel Valley (aka Armageddon). Second, we were staying on Mt. Carmel, referred to several times in the Bible as the site of assorted historic events. One site just a few miles from us memorialized the epic showdown between the prophet Elijah and the 450 prophets of Baal (cf. 1 Kings 18:20-40). 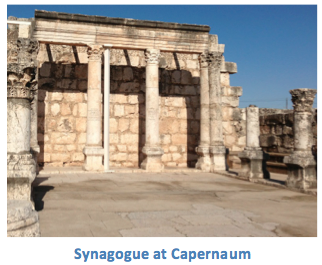 After making it to a snowy Jerusalem, we embarked on numerous day and half-day excursions in the Holy Land. We thought our first tour guide looked like Jesus, and one of our first stops was to visit the “upper room”, (curiously located above the universally recognized tomb of King David), where Jesus told his disciples that the Passover Seder, which Jews had observed since the Exodus from Egypt ~1500 years earlier, was pointing to Him and that from that point forward, what we now call communion would be “in remembrance of Him”. (cf. Mark 14:12-26). After “The Last Supper” the disciples went out on the Mt. of Olives, as did we. 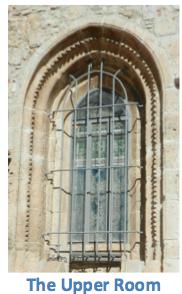 There is a church there marking where Jesus instituted “The Lord’s Prayer”. Another church walking distance away marks the Garden of Gethsemane, complete with very old “silent witness” olive trees. Another day took us to the mountain fortress of Masada. Today it stands as a stark reminder of the timeless value of liberty – sometimes taking precedence over life itself – as it did to the Jewish defenders two millennia ago. Yet another day included passing through the first recorded miracle location (water-into-wine at the wedding feast in Cana), the boyhood home of Jesus (Nazareth), the nearby town where He started his ministry (Capernaum) and where Peter and others lived, and eating roasted whole fish for lunch overlooking the Sea of Galilee (multiplication of loaves and fishes, walking on water, fishing on the other side of the boat). If you are still with me, I won’t bore you with the many other places we saw—underscoring and confirming Biblical accounts, save one more. 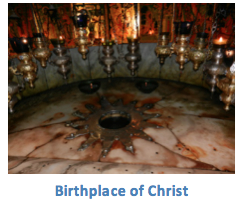 The way our schedule had been jumbled by the snowstorm, the first-on-my-list we visited last— the birthplace of Christ in Bethlehem. Nearly deserted the week before Christmas, our guide Issa (Arabic for “Jesus”), took us to the traditional location of the Shepherds’ field where angels announced His birth, the “milk grotto” (where Mary nursed the newborn Jesus), and of course the stable (cave) where Jesus was born, with the manger a few feet away. Today, as I type, the place is of course crowded beyond belief. Four days ago, it was nearly deserted. Due to the timing, we will have a simpler Christmas this year, but have received an indescribable gift already. We wish each of you a meaningful and merry Christmas!